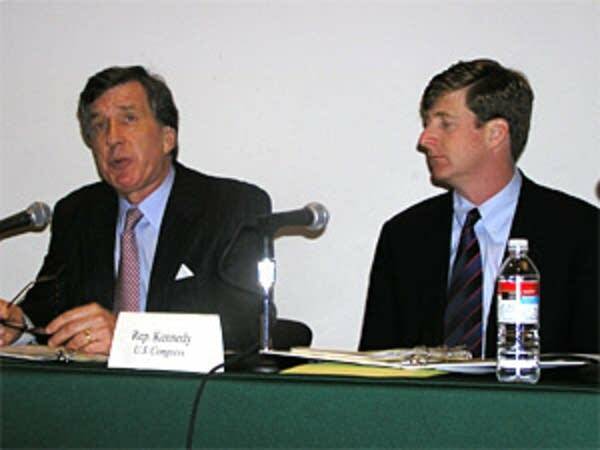 As part of that effort, U.S. Rep. Jim Ramstad, R-Minn., and Rep. Patrick Kennedy, D-R.I., held a public hearing at the University of Minnesota Monday on the "Paul Wellstone Mental Health and Addiction Equity Act." It's named after the late Sen. Wellstone of Minnesota, who was a strong supporter of mental health parity from insurance companies. Ramstad, himself a recovering alcoholic, says it's time to end the financial discrimination against mental health and addiction. "This is not just anther public policy issue. This is truly a matter of life or death for millions of Americans," said Ramstad. "And it's time this year, the time is now, to finish what was started in 1995 by our friend, Senator Paul Wellstone." Supporters say covering the cost of treating mental illness and chemical addition in the same way other medical treatments are covered by insurance not only would be the moral thing to do, but would also save billions of dollars. Bob Anderson, who described himself as an average guy who suffers from depression, told the congressional panel he was thankful treatment was available to him -- and that it should be available to anyone who needs it. "It just seems ridiculous that we would have different coverage for brain illnesses versus any other parts of the body," said Anderson. "You can't discriminate brain illnesses instead of heart or lung or any other diseases. This is a disease -- mental illness is a disease, and it has to be treated like any other disease." The lawmakers pushing the legislation say they hope to have a bill on the president's desk this spring.